AN AWARD-WINNING coffee shop dedicated to helping people furthest from the jobs market pick up new qualifications and find work has formally opened its new outlet in Rhyl. Chairman of Denbighshire County Council Pete Prendergast cut the ribbon – and poured the tea – at the official launch of Porter’s Coffee Shop at Rhyl Library and One Stop Shop. Part of CAIS Social Enterprises, Porter’s provides mouth-watering meals, snacks and drinks, while also delivering on-the-job catering, hospitality and customer service training to people furthest from the employment market. All proceeds are reinvested in the work of registered charity CAIS, which support vulnerable people in communities across Wales. Natalie Worgan, from Pensarn, is one of the first people to have taken advantage of the new opportunities on offer in Rhyl. The 31-year-old already held a BTEC qualification in catering, but has now been able to add supported practical experience and new skills to her CV. The mum-of-six said: “I suffered from mental health problems, and used to shut myself away in the flat. Porter’s Rhyl opened its doors late last year, and has been steadily building a loyal following. As a regular customer, Cllr Prendergast said he was pleased to formally open the revamped premises – which form just one part of a newly-enhanced service at Rhyl Library and One Stop Shop. 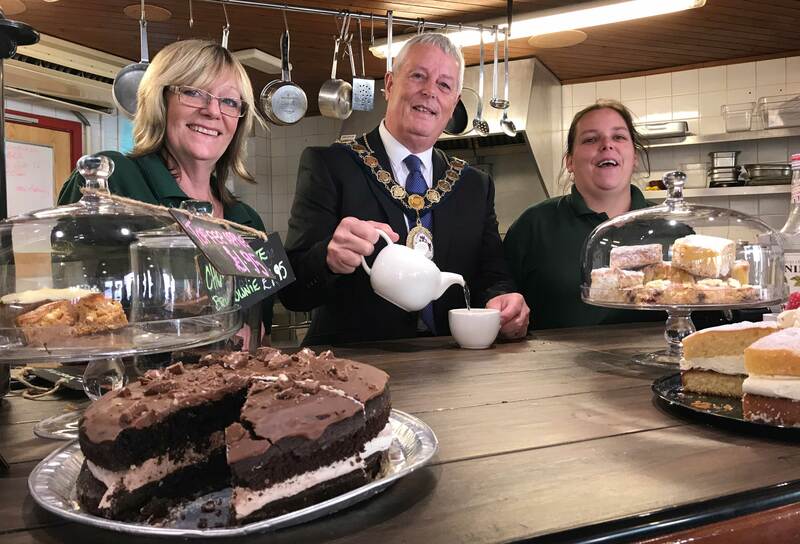 He said initiatives like Porter’s catering and customer service training were vital as the town gets set to capitalise on a multi-million pound redevelopment programme which will deliver hundreds of new jobs. CAIS Social Enterprises has already helped 119 people achieve 221 qualifications, with 51 moving on into rewarding employment. It has already been recognised as one of the leading community benefit businesses in Wales. Last year, CAIS Social Enterprises – which also runs Porter’s Coffee Shops in Colwyn Bay and Cardiff, the Troop Café veterans’ hub in Llandudno, and the busy Station Court meetings and events venue in Colwyn Bay – was named as a winner at the national Social Business Wales awards. Just last week, Porter’s won further plaudits after being invited to cater for hundreds of people at this year’s two-day awards and conference event at Llangollen Pavilion. The event came just a few days ahead of Social Saturday – a nationwide campaign designed to promote the benefits of businesses with a wider social purpose throughout Wales. The sector is worth £2.37bn to the Welsh economy and employs over 40,000 people with the help of over 50,000 volunteers. CAIS deputy chief executive Lynn Bennoch said: “Our catering outlets – which now number five throughout Wales – are much more than just coffee shops. We're thrilled to be part of Social Saturday Wales on October 14, and to feature in a special promotional video showcasing the sector in Wales! View below, or click here to explore a Social Saturday trail in north west Wales!